I was born on September 12, 1949, at Preston Retreat, a charity hospital for indigent mothers run by the Mennonites in Philadelphia. 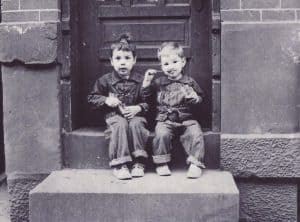 Our family left that city a few years later and moved to Washington, D.C. During the next fifteen years I grew up in one of the worst slums of the city, just a few blocks from the White House. Living in D.C., I had access to the many free museums and they became a second home – a refuge from the squalor and violence of my neighborhood. I loved the historical dioramas and the Indian artifacts of the Smithsonian and would read every word of every label. But the place I really loved was the National Gallery of Art. The guards knew me by name and allowed me roam at will. I could not imagine a more amazing place to work than a museum. When I was 12 or 13 I had what I can look back on as my first “aesthetic” experience in front of a small Sasseta painting in the National. That is when I decided to be an artist. During my undergraduate years in the 1960’s, I was completely committed to abstract and conceptual art. But after completing my art degree, I did a year of graduate work in London, England. This year in England, and my subsequent summer on the continent, decisively changed my art forever. From then on I have been committed to realistic painting in the Western European tradition. 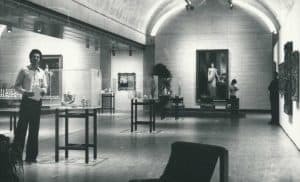 My art education was greatly enhanced by eight years as exhibit designer for the Kimbell Art Museum in Fort Worth, Texas. While designing exhibits for some of the greatest Renaissance, Impressionist and Asian art in the world, I met and worked with many of the leading art scholars of the day. My childhood dream of working in a museum had been fulfilled. One day, on a warm afternoon in the main gallery of the Kimbell, a single painting once again changed my life. It was an early portrait by Miro from his Barcelona period. I had often admired it, but on this occasion I was overwhelmed by the realization that I would soon be leaving this museum that I loved to become a full time artist. Shortly after leaving my regular job, I met my soon-to-be-wife, Leah, who was born and raised in Texas. It is a testament to her Texas grit and her faith in me that she married a penniless, unknown artist. Five years later we had a son, Sebastian. Our first ten years together, despite the chronic lack of money, were extraordinary. My studio was in our house so Leah, Sebastian and I were together 24 hours a day, 365 days a year. We will always be grateful for this priceless gift of time spent together. 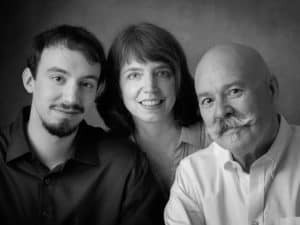 Twenty years ago we moved to beautiful Chester County, Pennsylvania, and my studio is still at home, though now in the carriage house of our 1894 Victorian home in Downingtown. My son is working on his doctorate in philosophy at Bowling Green State University in Ohio. Leah, Sebastian and I love spending as much time as possible together and I can honestly say that our lives remain extraordinary. Adrian Martinez is an internationally known professional artist whose work combines a rigorously classical technique with an intensely emotional vision. He was born in Philadelphia, PA, but grew up in Washington, D.C. He studied painting and printmaking and received degrees from the Maryland Institute of Art in Baltimore, Maryland (BFA), St. Martins School of Art in London, England (CS) and Purdue University in West Lafayette, Indiana (MA). Adrian is also an art instructor and lecturer who speaks on subjects which include art history, old master techniques, art appreciation and early Pennsylvania history. Adrian’s work is in public and private collections all over the United States and Europe. President George W. and Mrs. Laura Bush commissioned him to paint two large landscapes commemorating the National Parks theme for the White House holiday season in 2007 and these two works are now installed in the George W. Bush Presidential Library. Adrian designed the White House Holiday Card for President and Mrs. Bush in 2001. In 2010, Adrian was invited to Ankara University in Turkey to the Artist in Residence Symposium and two paintings are now part of the Ankara University collection. Some of his other public works include an 8 x 16 foot mural installed at Marshall High School in Marshall, Texas and a 10 x 20 foot mural which depicts the history of the Waggoner Ranch in the Red River Valley Museum in Vernon, Texas. He was commissioned by the Archdiocese of Philadelphia to commemorate St. John Neumann and St. Katharine Drexel with an etching in early 2000. Adrian created and curated a show at the Chester County Historical Society centered around twelve original paintings depicting the history of southeastern Pennsylvania from 1750 to 1800. The exhibit closed in December of 2017. Adrian is a member of Downingtown Friends Meeting, is on the Board of Trustees for Old Caln Meetinghouse, and serves on the Downingtown Planning Commission.